Heat oven to 375°F. Grease four 10- to 12-ounce casseroles. Cook ground beef, onion and bell pepper in 10-inch skillet over medium heat, stirring frequently, until beef is brown; drain. Stir in pizza sauce and mushrooms. Heat to boiling, stirring occasionally; reduce heat. Simmer uncovered 5 minutes, stirring occasionally. Spoon beef mixture into casseroles. Sprinkle 1/4 cup cheese on each. Mix Bisquick mix and very hot water; beat vigorously 20 seconds. Turn dough onto surface dusted with Bisquick mix; gently roll in Bisquick mix to coat. Shape into ball; knead about 10 times or until smooth. Divide dough into 4 balls. Pat each ball into circle the size of diameter of casserole. Cut steam vent in each circle with knife or cookie cutter. Place each circle on beef mixture in casserole. Bake 15 to 20 minutes or until very light brown. For 21 grams of fat and 425 calories per serving, use Italian turkey sausage. For variety, add sliced ripe olives, sliced pepperoni (cut into fourths) or chopped tomatoes instead of the mushrooms to the pizza sauce mixture. 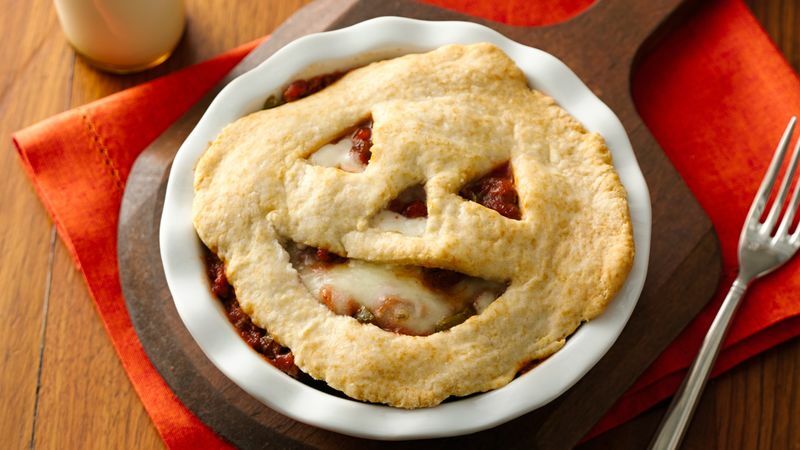 For a special Halloween treat, use a small cookie cutter to cut a jack-o'-lantern, cat, pumpkin or moon shape of the dough circle before putting it on the beef mixture.